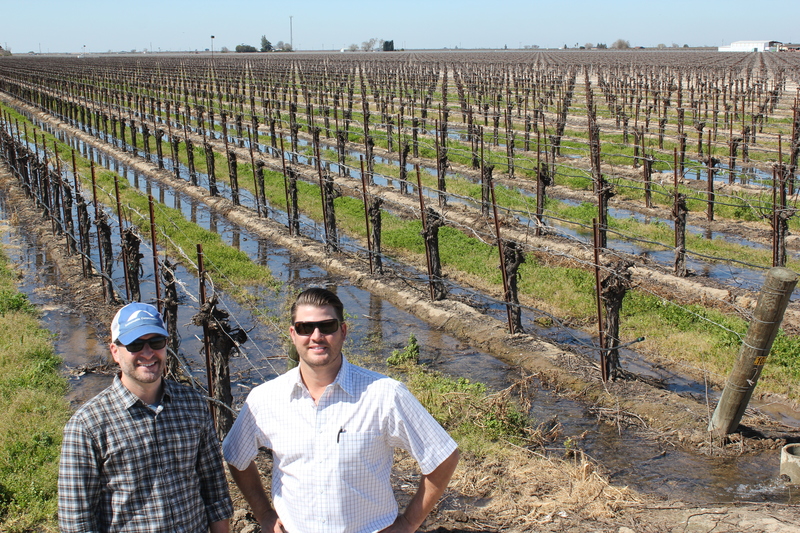 Sustainable Conservation Project Director Joe Choperena (left) and Madera Co. farmer Brian Davis in front of a vineyard intentionally flooded to refill depleted groundwater supplies. No matter where you live in California, chances are you’ve experienced firsthand the near-record rain and snowfall the state received these first months of 2019. And, forecasters aren’t telling us to put away our rain boots just yet. Despite some soggy shoes and socks, Sustainable Conservation and our agricultural partners couldn’t be more thrilled. With the abundance of precipitation this year comes an equal abundance of opportunity to put all that water to good use for the dry times ahead. 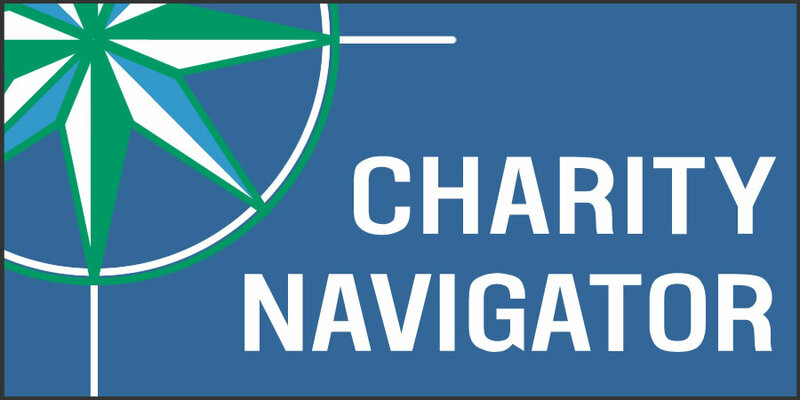 We’re continuing our pioneering efforts with Central Valley farmers and water suppliers – especially those in the farm-rich but arid San Joaquin Valley – to advance the promise of on-farm groundwater recharge. You see, despite the drought-busting precipitation California has received so far this year, drought is in the state’s DNA and never too far off. This is especially true as a changing climate is expected to usher in longer, hotter droughts and more frequent and intense rainfall that heightens flooding risk. The takeaway from this winter’s deluge? California needs multiple options to capture and save as much floodwater as possible when it hits for the future dry years we all know are coming. On-farm groundwater recharge is a creative way to boost water supplies in California that benefit farmers, local communities and the environment. 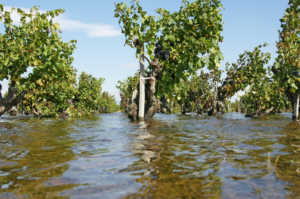 On-farm groundwater recharge involves flooding active cropland, like vineyards or almond orchards, and allowing the standing water to percolate quickly below the crop’s roots to refill depleted aquifers. A refresher on how it works … when it rains a lot and rivers get swollen, available floodwater that would otherwise flow out to the Pacific Ocean is diverted, funneled through existing irrigation canals and then spread onto farms that are actively growing crops or are between crop rotations. This includes food California is well-known for … like almonds, walnuts and wine grapes. The water then percolates through the soil and eventually fills up depleted underground aquifers. It stays there until it’s pumped out to irrigate crops, and to provide local communities water for drinking and household use. One of the many San Joaquin Valley farmers stepping up this winter to move the needle on replenishing Valley groundwater supplies is Brian Davis of Madera County. 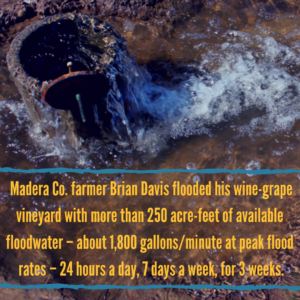 Throughout March, Brian applied over 250 acre feet of available floodwater – with peak flooding rates topping 1,800 gallons a minute – 24 hours a day, seven days a week for three weeks on his wine grapes and almonds. An acre-foot of water is about what an average California household uses in a year for both indoor and outdoor use. 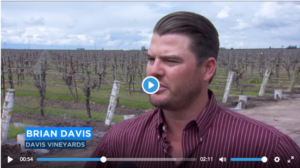 ABC30-TV recently spoke with Madera Co. grower Brian Davis and Thomas Greci, Madera Irrigation District General Manager, about our joint effort to boost the region’s groundwater supplies. Brian’s recharge project wouldn’t have been possible without generous contributions from the Madera Irrigation District – which not only provided water for free to growers while supplies lasted but also led critical outreach to area growers in demonstrating the many benefits of on-farm recharge. With the growing season underway, the district is also keeping water as affordable as possible to encourage area growers to use their irrigation pumps as little as possible, keeping more water in the ground. We recently helped Madera Irrigation District host a workshop for local growers, so stay tuned for more! Follow us to hear more about folks like Brian and the Madera Irrigation District who are promoting a major shift in thinking in California – that the huge volume of floodwater we’ve seen this year is a vital resource for creating a more resilient, dependable water supply for the state.